Yesterday Jen and I discovered something surprising. We both had today off of work. We had both planned to spend today getting things done around the house, the general type of chores that we struggle to get accomplished on a weekly basis. Bringing the Wombats to day care and having eight solid hours is usually enough to get us caught up on all our laundry, dishes, and other general tidying. Don't get me wrong, this does not leave our apartment in a fantastic state. Instead it merely leaves our dwelling inhabitable but that is the most we can hope for. With some level of guilt (from Jen, not me) we dropped the Wombats off at day care this morning and got to joining forces to get our chores accomplished. 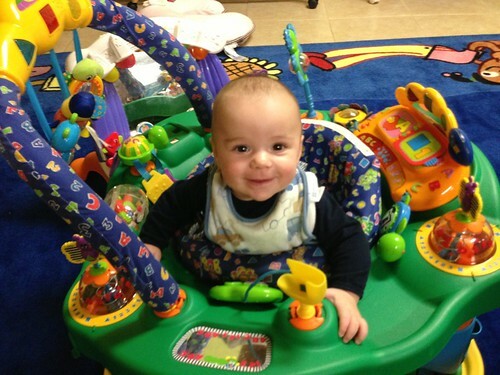 Elliott was not too broken up about this as he enjoyed his favorite seizure-inducing workstation toy. I don't think he missed us for a second. Among our chores included going to town hall to pick up the babies' birth certificates. We figured we'd stored up enough shame that we'd better pick them up today before our shame grew too all-consuming. Then we did the unthinkable--we went to lunch! 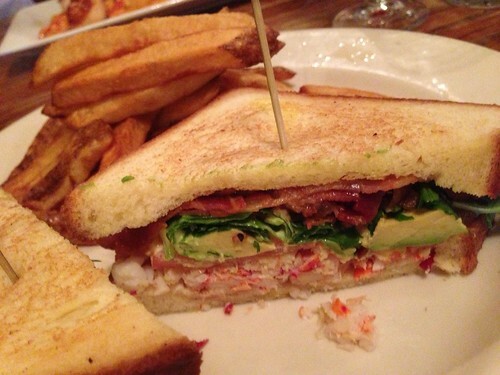 The restaurant I selected was The Ginger Man in Greenwich, Connecticut. As we got our drinks Jen asked how I'd found this place. I told her that I'd gone to Google and searched for "greenwich connecticut beer" and this was the first place that came up. They had an amazing beer menu including a large number of seasonal beers on tap and in the bottle. We kept it seasonal. 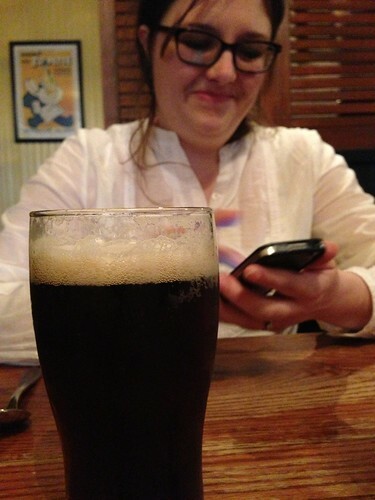 Jen ordered the Mild Winter from Goose Island Beer Co., paying homage to her family's home: Chicago! 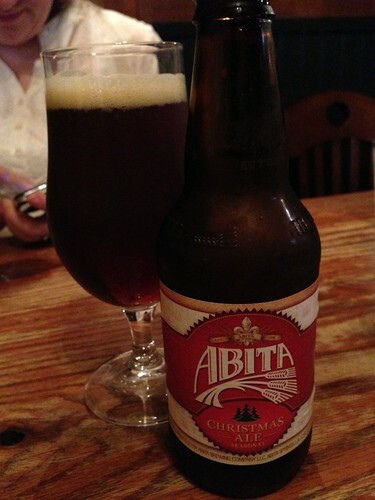 I ordered the 2012 Christmas Ale from Abita Brewing Company in Louisiana, paying homage to a state that I knew someone that came from there once! 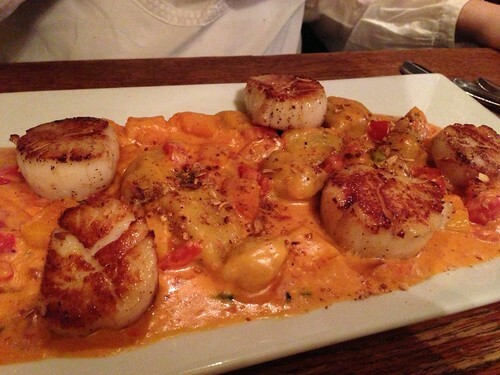 We shared the lobster club and pan seared scallops with gnocchi after the sweet potato clam chowder. We came for the beer (well, at least I did) but the food was excellent as well. We definitely look forward to going back to The Ginger Man soon, perhaps when the boys are five. When we put the boys to bed we had a quick light dinner of salad and leftovers since we'd had a pretty rich lunch. We also took an awesome nap. So the chore-doing aspect of today was not that successful but mentally it was an extremely cleansing experience. By the time we picked up the boys at day care we were thrilled to see them. It is the eternal paradox of parenthood that you can love someone as much as you love your children yet simultaneously be over the moon about getting a few uninterrupted hours away from them. 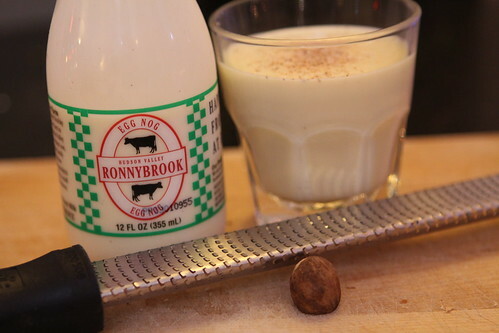 After dinner I had a glass of eggnog and relaxed as we watched Elf. When we put the Wombats to bed Jen checked on them and observed that they were doing a sleeping fist bump. I checked them out and thought it looked a little bit more like the Fusion Dance in Dragon Ball Z. I was able to snap this picture in the darkness using my flash. 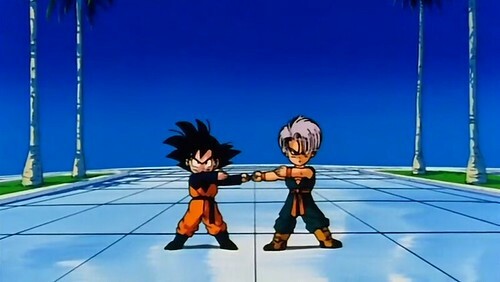 I think you'll agree that they are most likely practicing the Fusion Dance so that they may one day merge into an even stronger warrior. Martelliott is going to be a very powerful baby indeed!